I arrived at the Apex Bridge boat launch parking area around 8 a.m. under bright sun and crystal clear blue skies. I parked and walked down to the reservoir’s edge and was amazed and shocked to see how low the water was. The old bridge that used to connect the old NY 10 and NY 268 was fully exposed as was old NY 10. 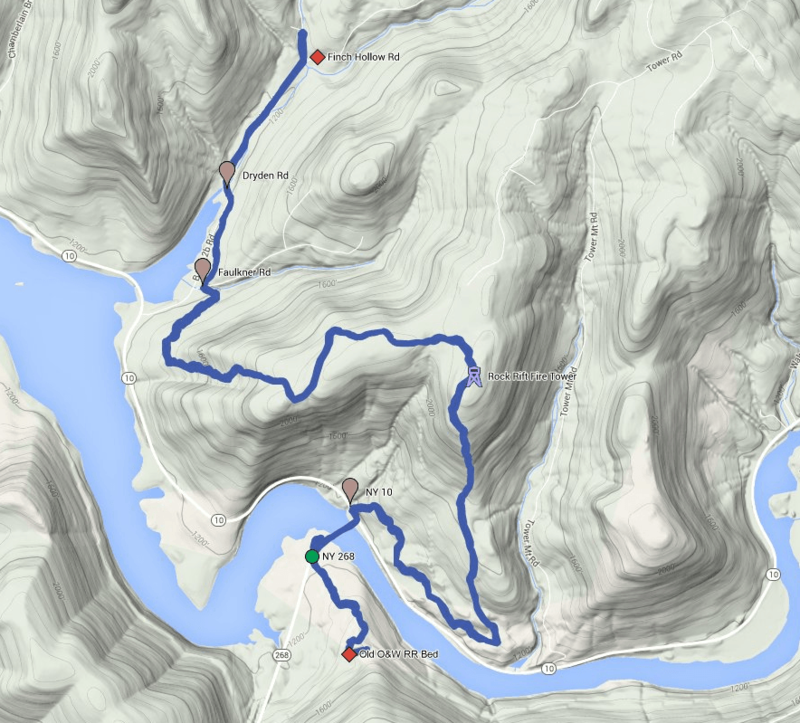 After taking a few pictures of the reservoir I pulled on my pack and headed up to NY 268 (mile 0.0 – 8:11 am). 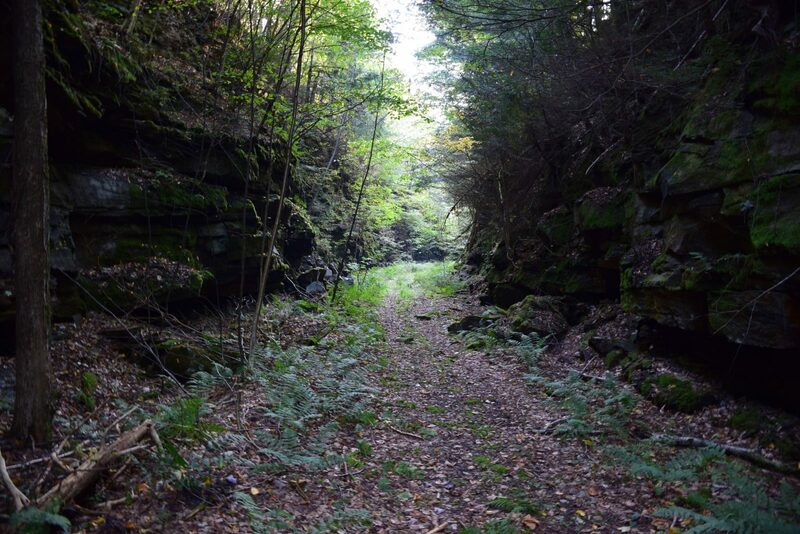 I crossed over and headed up the trail to the railroad bed cut. Before reaching the cut I stopped at an overlook to capture a couple of pictures. I arrived at the cut (mile 0.9 – 8:39 am) and was a little disappointed; when I had arrived at the cut the previous year there had been fog and the sun’s angle had been different so that it shone down through the cut. It had made it appear as if it were something out of a fantasy novel or movie. Now there was no fog and the sun’s angle was further to the south. 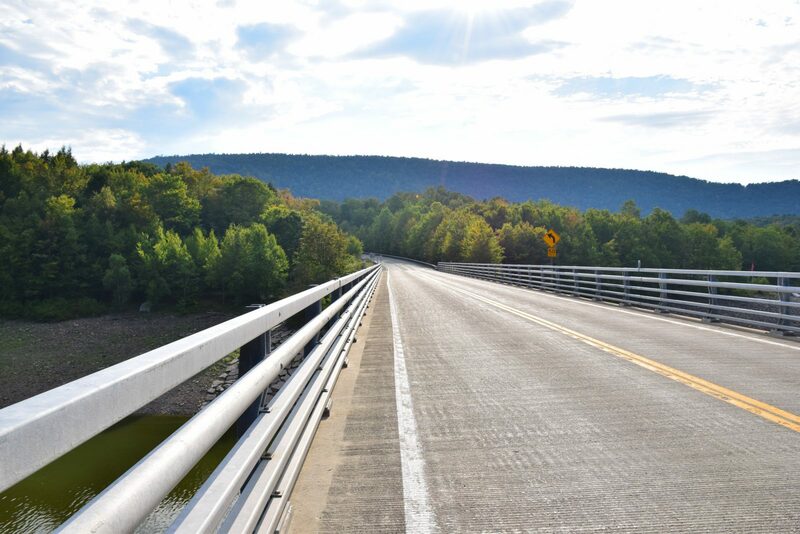 After taking several pictures I back-tracked down to NY 268 and headed across the bridge to NY 10. I took a few more pictures as I walked across the bridge. Upon reaching NY 10 I turned left and found the trail head not much further along (mile 2.2 – 9:11 am). I left the road behind and headed up a quick climb of about 175 feet; I had no idea what was in store for me ahead. 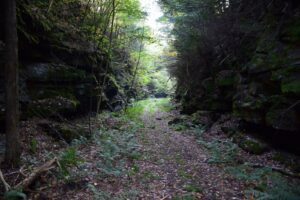 After that quick climb the trail meandered along near NY 10 and undulated through a number of small valleys. At one point the trail crossed a small dirt road and made its way across an open field. The grass was still wet from the dew, but the sun was bright and warm. I walked along a mowed path and re-entered the woods and continued along the rise and fall of the path. The trail then took a turn to the left and began to climb up to the Rock Rift Fire Tower (mile 3.3 – 9:51 am). The trail rose steeply in many places and in total climbed 1100 feet over 1.5 miles. I was breathing heavy as I finally reached the top of the hill and the trail leveled out. It continued on along a flat section that might have been an old logging road many years ago before turning and to reveal Rock Rift Fire Tower (mile 5.1 – 10:41 am). The fire tower had been abandoned many years ago and was no longer in use. I dropped my pack at the base of the tower and took out my camera. I carefully made my way to the top and found that the observation deck was not locked. All of the glass in the windows was now gone, but that allowed for an unobstructed view. I took in the panorama and snapped several pictures before climbing carefully back down. After safely reaching the ground I took a few pictures of the fire tower itself and then moved my pack into the shade and sat down for a snack and some water. After a short rest I started out again. The trailed continued along a ridge for a while, rising and falling. After a short distance I came upon a warning sign to FLT hikers (mile 5.7 – 11:22 am) . It advised that the bluestone quarry ahead was private property and to stay on the trail and be aware of equipment. 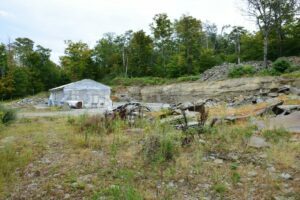 Since it was Saturday the quarry was quiet and I passed through quickly. Not long after the trail turned down sharply and descended over 1000 feet over the next 1.25 miles before coming out next to a small stream on Faulkner Rd. I crossed Faulkner Rd (mile 7.5 – 12:23 pm) and continued on heading north. I passed through an old overgrown field; small trees and brush had grown up, but I could see the hills off to the west. As I moved further north on the trail I could see Dryden Rd to my left. The trail opened out on Dryden Rd just before a stream. The bridge over the stream had recently been worked on; some of the construction equipment was still in place. I crossed the bridge and found a tree and some shade on the other side where I sat down and had my lunch – peanut butter and jelly, some pretzels and a banana (mile 8.0 – 12:39 pm). After resting for a while I pulled my pack on again and headed up the road. I only had a short road walk ahead of me, less than a mile to Finch Hollow Rd. As I walked up the road I saw two men coming out from along a tree line to the left, one older and the other younger. The older man was carrying a pack with “blaze orange” on it. I assumed they were locals checking out hunting grounds. I greeted them and found out they were loggers who were out marking property lines. 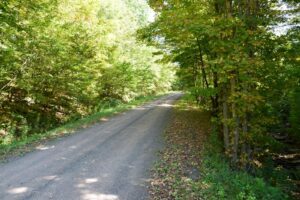 They asked what I was doing and I pointed to a white blaze on a telephone pole nearby and started to tell them about the Finger Lakes Trail, the older man was familiar with it and had hiked some of it himself. I continued on with them up the road until we reached their car at the intersection of Dryden Rd and Finch Hollow Rd. I wished them well and I continued on up Finch Hollow Rd a short distance to be sure I had reconnected my previous hike; I had hiked this section over two years ago. After reaching Fletcher Hollow Rd (mile 8.9 – 1:08 pm) I saw an FLT sign and began to recognize the area and turned around to begin the trek back. I passed by the tree I had just recently eaten lunch under and left Dryden Rd behind. Clouds were starting to build as I crossed Faulkner Rd (mile 10.3 – 1:35 pm) which would prove to be somewhat of a blessing. The climb back up to the fire tower was steep and strenuous and I was happy not to have to sun beaming down on me. After finally reaching the ridge line again I passed through the bluestone quarry and then on up a little more to the fire tower (mile 13.1 – 3:15 pm). I stopped again under the same tree as I had earlier, but this time decided not to venture up into the observation deck since the sky was clouded over. After a short rest, some water and a banana, I moved on. I had about three miles left and a long and steep downhill ahead. The climb down from the fire tower was steep, but not as difficult as I had imagined, or feared, it to be. I found myself back at turn in the trail (mile 14.7 – 4:07 pm) and the sun was now breaking through the clouds. I breathed a sigh of relief believing that the hills were done; I had forgotten that the trail made several more small up and down climbs before coming back out on to NY 10. The total additional climb was about 200 feet, and after the long climbs I had done earlier in the day I was tired and did not want more hills. I finally crested the last little hill and began a quick descent on to NY 10 (mile 15.8 – 4:39 pm) and now breathed a true sigh of relief. The walk back to the parking area at the Apex Bridge boat launch would be easy. I stopped to take a few pictures as I crossed the bridge. I could see the old NY 10 road sections along what had once been a small stream, but was now the headwaters of the Cannonsville reservoir. I imagined the cars that had traveled along that road and the families that had watched the small stream pass by. I crossed the bridge and was soon at the entrance to the boat launch and walking down towards the parking area. I arrived at my car exhausted and a little sore (mile 16.49 – 4:48 pm) . This had been a more rugged section of the FLT and I felt it in my muscles. It had been a good hike, but now it was time to head home and enjoy a hot shower and well-earned meal. 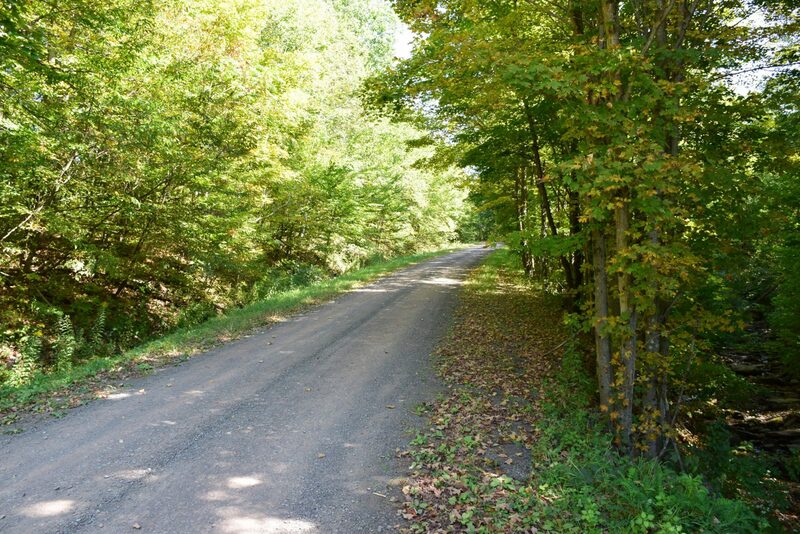 Scott, great writeup, I know the piece of trail on both sides of NY 268 really well…but, wondering why you just didn’t return back via the blue-blazed trail to save you the effort of having to reclimb the trail back up to the fire tower ??? Thanks Larry. The reason goes back to when I first started hiking the FLT in 2010. I parked my car at the trailhead and hiked out-and-back. Then the next hike I start where I turned around the last time. After the first couple of hikes I decided I wanted to work on an e2e and since I had already been doing the out-and-back I would keep doing it. So technically when I finish I will have completed the trail twice. Brings back lots of memories of the Alley Cat that built the new trail. Glad you had good weather. That hike up to the tower is a BEAST…Matt and I blazed it on the way down. Yes, it definitely is a tough one. Out of all my hikes it was #5 in total ascent and #6 in average ascent per mile (out of 31). So not the ruggedest, but right up there. Three of us hiked Falconer Rd to Rt 268 on 10/16/2015 and we were disappointed to discover the bottom section of stairs on the Rock Rift fire tower have been removed so we were not able to climb to the observation platform. Hi Paul, yes the fire tower has been abandoned and is no longer maintained. I believe that the DEC removed the bottom set of stairs to keep people out of the tower. Since it is not maintained it could be dangerous; the wood on the stairs could be weak or rotted just as an example. I know that the DEC has been restoring some of the old fire towers, but I don’t know if there are any plans to restore this one. 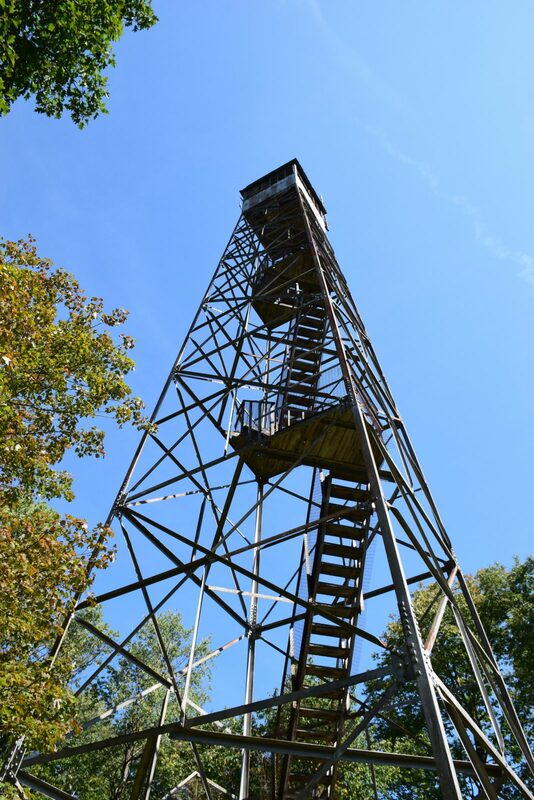 I have heard thru Rick Roberts that there are ‘plans’ to restore the Rock Rift Fire Tower…but I have no details. That would be great if they did. Thanks Larry.